I have seen the Taj Mahal, so can now die happy. In addition, I have now seen Agra Fort and India Gate. 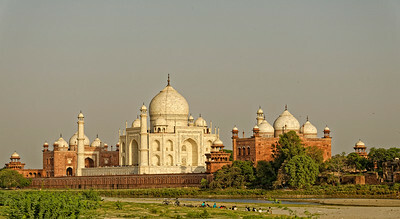 One of the two mosques which stand either side of and complimenting the Taj Mahal. 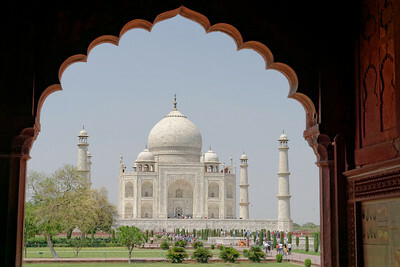 The first view one sees of the Taj is through the main gate, above the heads of the others there for the same purpose. There is a queue to take this picture from the very centre of the gate. 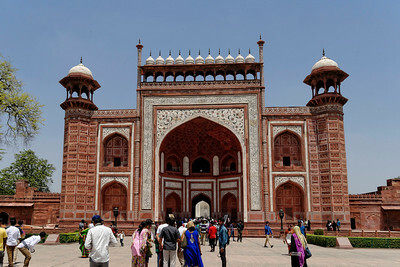 The gate to the Taj Mahal. On top there are 22 small pointed domes, one for each year of its construction. 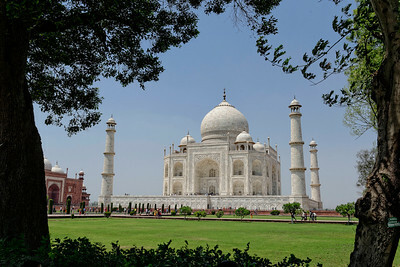 The inlaid white marble is the same as on each face of the Taj. 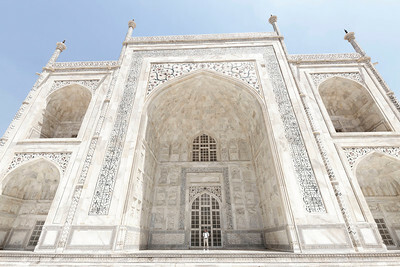 Hawkeye standing in one of the entry ports of the Taj Mahal, demonstrating the sheer size of the mausoleum. 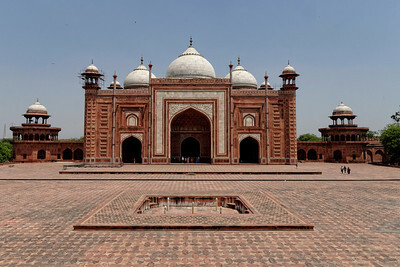 The four faces and portals are identical, although some are less crowded with tourists than others. 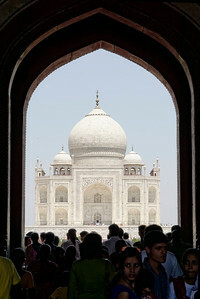 A slightly different angle of the Taj, from beneath one of the crenelated cloisters of the gateway. The gateway to the taj Mahal from within one of the cloisters surrounding the compound outside. These cloisters apparently were the living and working quarters of the thousands of workers and artisans who spent 22 years building the Taj. 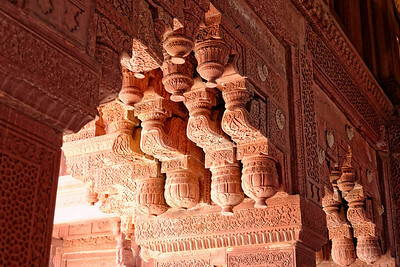 One of the entry points to the Agra Fort, home and then prison of Shah Jahan, the builder of the Taj Mahal and husband of Mumtaz Mahal, both of whom are buried in the Taj. 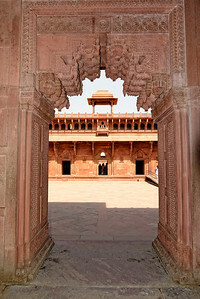 A view through one of the many doors and courtyards of the Agra Fort. 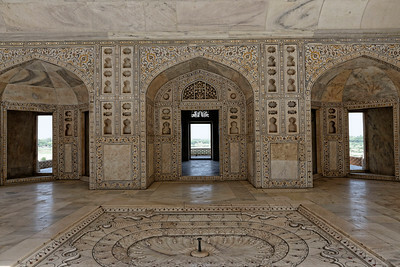 One of the many rooms in Agra Fort, this one richly decorated with inlaid semiprecious stones in the white marble. 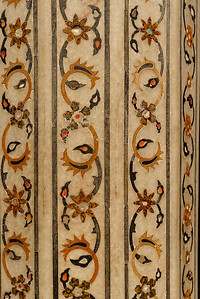 A detail of the semiprecious stones inlaid in the white marble at Agra Fort. 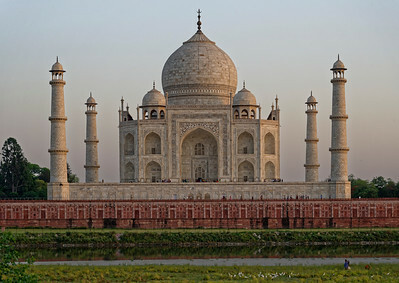 The Taj Mahal has the same decoration on a much grander scale. 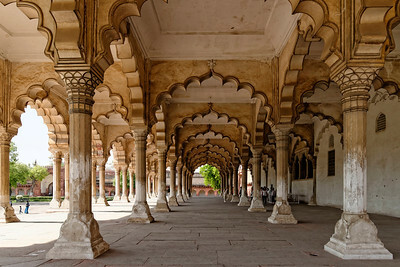 One of the many arcaded courtyards at the Agra Fort. Only about 20% of the Fort is open to the public, the rest is used by the Indian military as barracks. The classic shot of the Taj Mahal at sunset, from the other side of the river, where Shah Jahan planned to build a black Taj, for his own mausoleum. 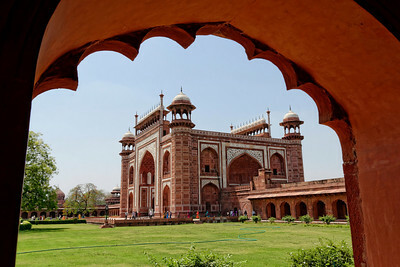 His son disagreed and imprisoned Shah Jahan in the Agra Fort for the rest of his life. 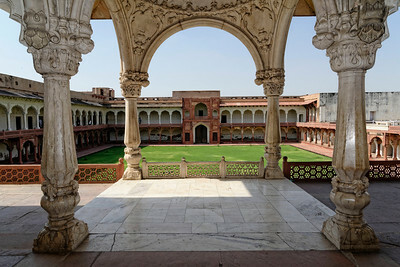 The great audience hall at Agra Fort, where Shah Jahan would meet and listen to the common people, and dispense justice to them. Some local colourful women, posing in front of the well known monument. Fifty rupees goes a long way to paying models in India. 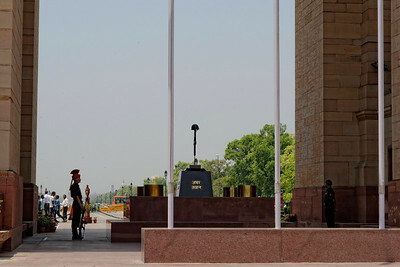 The cenotaph below India Gate, India's national war memorial. India Gate, India's national war memorial. I was lucky enough to visit it on ANZAC Day, Australia's national war memorial day. It meant more to me than most of the tourists that day. 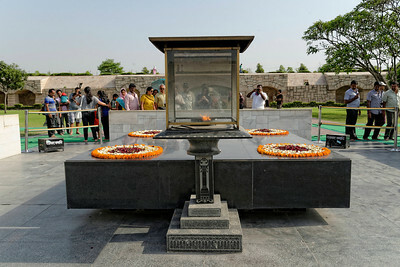 The black marble monument on the site of the funeral pyre of Mahama Ghandi. 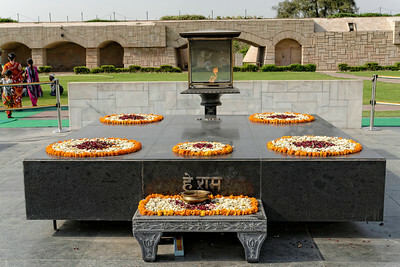 The words on the front of the memorial to Mahatma Ghandi read "Oh, God!" which he apparently said after he was shot by a member of his own party. 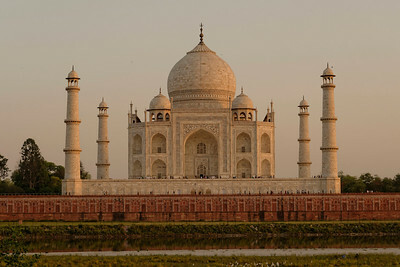 A different aspect of the Taj Mahal. Hard to get a view that is unique or different, but the trees soften the stark white of the mausoleum against the sky. A slightly different angle of the great mausoleum, from across the river.